White waves rolled on a stiff northwest wind. The air smelled damp, heavy with the mist of water roiling over the rock-strewn shoal. Between the clouds, the noonday sun mapped the strait’s depths, separating the shallows from the cold abyss with graduating shades of watery tan, forest green and deep navy blue. As I recall, it was early August, about 1770. I was a lad of twenty, and it was my first visit to the fort at Michilimackinac. The fort’s water gates were open and unguarded, which perplexed me. Outside a Canot du Nord rested on its gunnel with a tarp staked firm and stretched tight over the hull, providing shelter from the wind. A voyageur in a white capote gazed out across the lake, longing for the paddle, but the wind pressed constant, shy of a howl. Even within the palisades rattails blew in my eyes, to say nothing of the fine sands of Lake Michigan. I stepped behind a trader’s house and pulled the black silk headscarf lower, hoping at the least to control the unruly wisps of hair. As I stood, the white capped waves filled the fort with a rattling, tympanic rumble; and all the while the British Red Ensign snapped and popped just below the gold ball atop the pine flagpole in the middle of the parade ground. I remember hearing a fife’s melody coming from within the guardhouse. 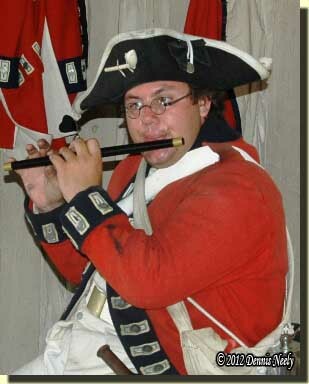 A British soldier, a member of the King’s 8th and a veteran of three winters at Michilimackinac, sat on the far corner of a bunk with the wooden fife to his lips, serenading no one in particular. He glanced at the door where I stood, nodded and returned to his leisure. Around the corner I dallied at the Church of St. Anne. Finding the sanctuary empty, I slipped into the last pew, prayed for a moment and reflected on the sights I had seen thus far on that journey. In due time, the smell of pastries attracted me to the north door of what was called Langlade’s house. 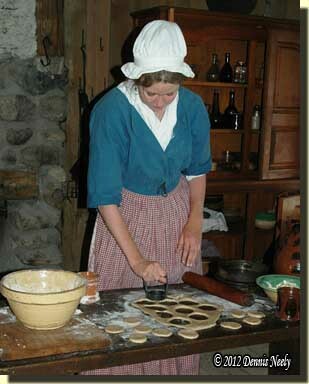 On a table in front of the hearth, a young woman had just cut circles from fresh-made dough. I startled her when I spoke. She was preparing the blackberries for the tarts’ centers and dropped one on the floor. The conversation was short, for the other hunter found me and told me his business at the fort was done and that we must leave. We spent that night and the next day in the forest to the west, waiting on the wind. Memories created at Colonial Michilimackinac have a special place in my heart and the stories of my alter ego. I remember visiting the fort as a youngster as it was being re-constructed, based on the archeological record; the Mackinac Bridge was new then, too. I recall thinking how cool it was to be able to dress up like a Red Coat and fire those big flintlock muskets. Little did I know what the future held for me. In a way, the fort’s history represents a bit of a problem for my persona, a hunter from the lower Great Lakes in the 1790s: the fort was relocated to Mackinac Island in 1780 and the remaining palisades and building parts that were not moved were burned—nothing of Fort Michilimackinac existed in 1790. As traditional black powder hunters, we often get so embroiled in re-creating a single chase recounted in an old journal that we fail to see the need for adding depth to our character’s life. On a number of occasions I have concentrated on one historical day, only to be disappointed with the results of that sojourn. Upon reflection I have come to the conclusion that those particular efforts were more two dimensional than three dimensional. True, the main purpose of traditional hunting is to put food on the table and to do so in a period-correct manner, but the richness of the portrayal is dependent upon the diversity of 18th-century moments that our persona experiences along the way. In the last few years, my woodland pursuits have centered on the time just before and just after the Battle of Fallen Timbers (August, 1794): fall of 1793 to spring of 1796. There is no special reason or significance for this choice; it is just a point on my journey back in time. But I have also put more emphasis on “back story,” what happened in my persona’s life in the years leading up to a given hunt. A recent trip to Mackinaw City included a mandatory stop at Colonial Michilimackinac, primarily to see the construction progress on the new “Southwest Rowhouse.” Each summer, I have stood in that area of the fort and talked with archeologists excavating the remains of this structure. Seeing it take shape is a natural extension of that process, and I can’t wait to walk through the old rowhouse. Whether in period-correct clothing or “civilian garb,” I never fail to feel a sense of belonging when I enter the fort. I suppose that is a part of time travel, feeling right at home when surrounded by 18th-century stimuli. But my fort impressions are much different from those of the other tourists. Just passing among the buildings creates memories. On this last visit the wind, waves and constant whipping of the British Red Ensign created a pristine moment. Andrew’s playing of the fife and Madeline’s pleasant smile as she prepared blackberry tarts added depth to the experience for me. As a living historian, it was my task to place these pristine moments within a proper context. The Mackinac State Parks Commission presents the fort as it existed in the late 1770s, and because my persona was born in 1750, I would have been in my twenties then. As a hunter who supplied meat for General Washington’s soldiers during the American War for Independence, I would have been considered a spy had I visited the fort in the later years of that decade. Like all visits to Colonial Michilimackinac, I came away with a campfire tale that fleshes out my persona’s youth: a simple trip to the British fort and a wind too treacherous to tempt. 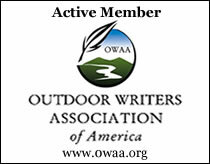 This entry was posted in General, Living History, Persona and tagged Dennis Neely, North West trade gun, Northwest trade gun, traditional black powder, traditional black powder hunting, traditional blackpowder, traditional blackpowder hunting. Bookmark the permalink. Fort Michilmackinac is my favorite fort also. I remember going with my parents as a little kid then returning home only to try and recreate the fort with my Marx’s play set. 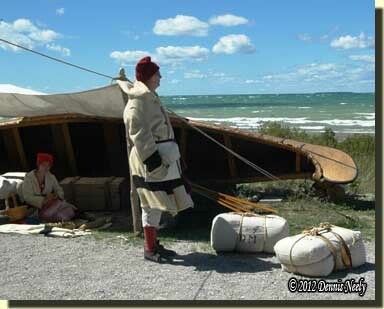 I have since done several reenactments there camping on the grounds and participate in the activities of the day. One special time was when after a event ended and everyone left, I wasn’t leaving until the next morning. I was given permission to stay, I was the only person on the grounds for the night. I couldn’t enter the fort itself but camped out side the fort listening to lake was the coolest thing. When hunting in the UP I am a hunter from the fort who cross over to the other side of the big water looking to supply meat for the fort. It will always be a special place to me!